Before the end of June passes us by – where did this month go?! – I thought I would take a moment to chat about the new Fibre Club option here at Wool n’ Spinning. There are a few spots left and these packs of fibre will always be mailed out in the middle of the next month. As a way to support the work happening here at Wool n’ Spinning, two of the Patreon support rewards include receiving the fibre club. 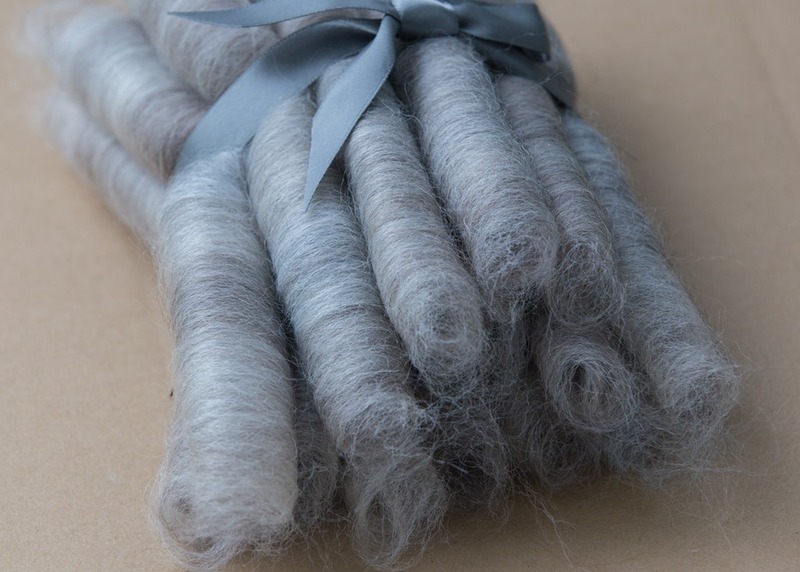 By choosing one of the two fibre amounts, each month you will receive a little pack of fibre prepped by myself in a colour that has been particularly inspiring to me in the previous weeks. By choosing either 25 or 50 grams, you will have a chance to play with many different preps. Sometimes they will be in the form of little nests of fibre, punis or even rolags. 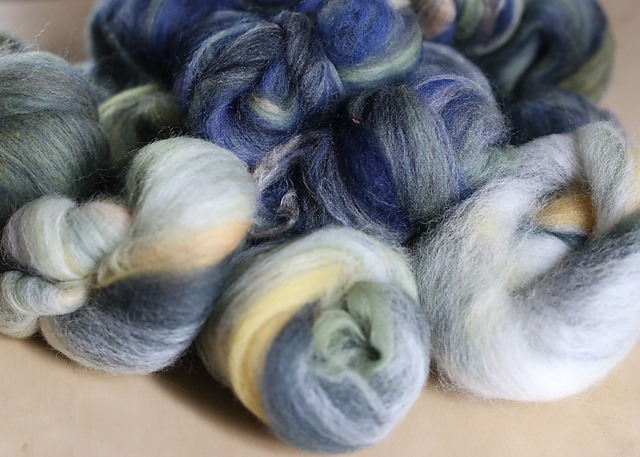 Over time, I hope that if I come across a neat blend, breed or prep, I can offer it to you as the club fibre. Stay tuned! Above: Nests of fibre ready for spinning. Below: Punis-style rolags, also ready for spinning. 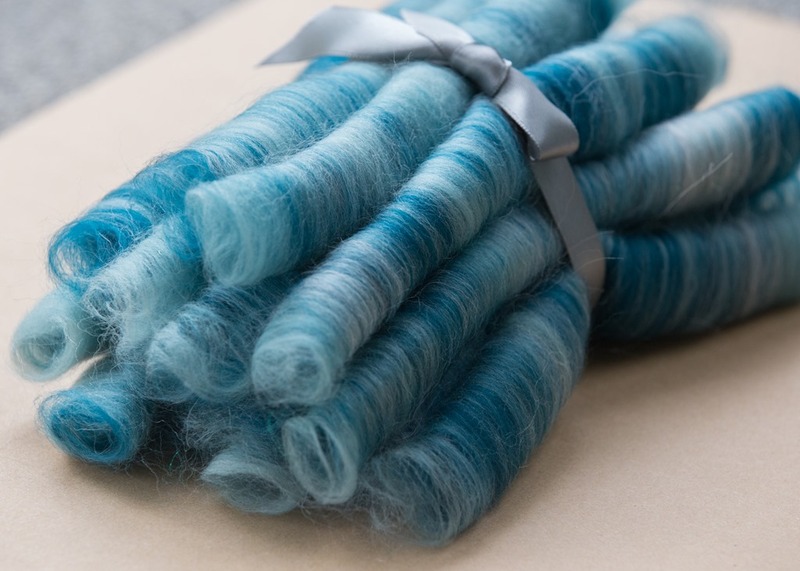 See May 2014’s podcast for a detailed demo of how to spin a punis-style rolag on a spindle. More on that in the future! Batts, punis and rolags are woollen preparations that offer a wonderful way to begin to practice woollen-type spinning drafts. I love playing with colour, blending in texture and spinning semi-woollen, so this is a chance to dip your toes in and explore some different fibre preps and drafting techniques. One of the ways I like to spin these bundles of fibre is by allowing some twist to enter the drafting zone. In a nutshell, allowing some twist to enter your drafting zone is a step towards releasing some of the control around how the twist enters your yarn. A pinch, pull forward, let it go, return to your fibre supply to pinch again and pull forward is a wonderful technique to practice. A little bundle of prepared fibre goes a long way, whether on a wheel or spindle! This is one of my most favourite drafting techniques to use on my Turkish spindles. The resulting yarn is bouncy, airy and lofty, which preserves the woollen preparation. Would you like a hint about the colour of July’s fibre club? Norah’s sweater inspired the colour and prep. I will be posting spoilers, along with the way I spun the club fibre, in mid-July after I have mailed out everyone’s fibre. You can choose from either 25 or 50 grams. Monthly teaching content. The first milestone we already unlocked (!!) was the supplemental teaching content over and above the weekly video logs. These short videos will highlight a technique, fibre preparation or any related handspinning question I have received from you. They will first be available to Patreon supporters through an early access link, then released publicly at a later date. More fibre club. Part of what makes fibre club so fun is talking about it! Let’s share how we are exploring our sample packs together in a forum that allows us to compare, share and update one another on our progress. Stay tuned. Breed Studies. The next milestone we are working to unlock are biannual breed studies that allow our community to work alongside one another as we explore wool, preparation, spinning techniques, dyeing results and anything beyond (ie. weaving, knitting, etc.). In a community that encourages learning, exploration and reflection, we will be able to experience first-hand how various breeds spin up differently. I will facilitate the study by offering the forum, fibre for purchase and educational content as needed. Patreon supporters will be able to direct, vote and explore the breeds they want to spin. Community. We love to chat, share and support. Spinners around the world are hoping to connect with one another to share our learning, growth and, of course, participate in an ever-evolving Show-and-Tell! I am so excited to be able to offer multiple forums for us to do that more intimately. Stay tuned for some ongoing forums to be able to connect face-to-face in a synchronous fashion. Let’s go on the road! Or airplane. Or boat. Whatever mode of transportation is necessary for us to be in the same room, at the same time, learning together.